A return to bowl games and tournament play for the Fighting Illini? At a recent event at Burke, Warren, MacKay & Serritella, the University of Illinois’ Athletic Director, Josh Whitman, told attendees that it could happen sooner than you think. Since his hire in February 2016, Whitman has made a number of strategic personnel moves, including the hiring of former Chicago Bears coach Lovie Smith and basketball coach Brad Underwood. 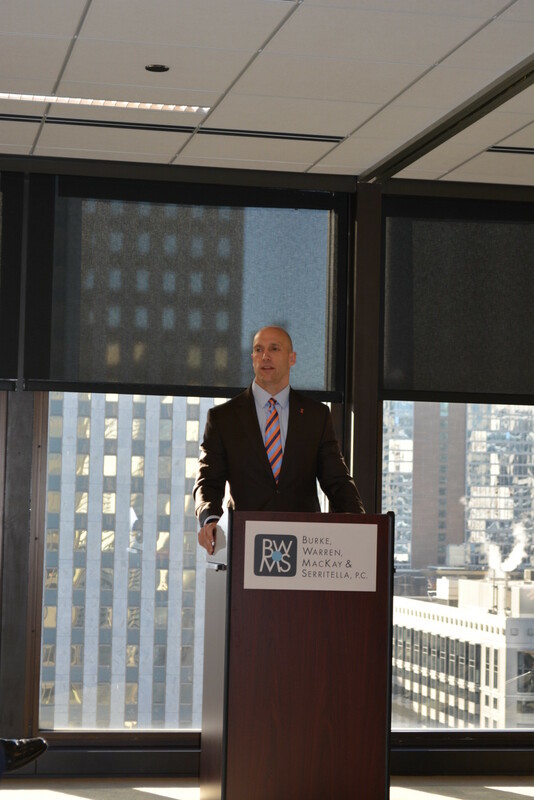 Whitman, who played in the NFL and then practiced as an attorney before beginning his career in collegiate athletics administration, addressed attorneys, clients, and friends of the Firm, recapping his efforts to reestablish the Fighting Illini as a championship contender, describing his vision for the athletic department, and answering questions from attendees. Approximately one quarter of the Firm’s attorneys have at least one degree from the University of Illinois.